We've been the happy recipients again of fresh snapper caught by my daughter Rachel and partner Rod in the Hauraki Gulf. 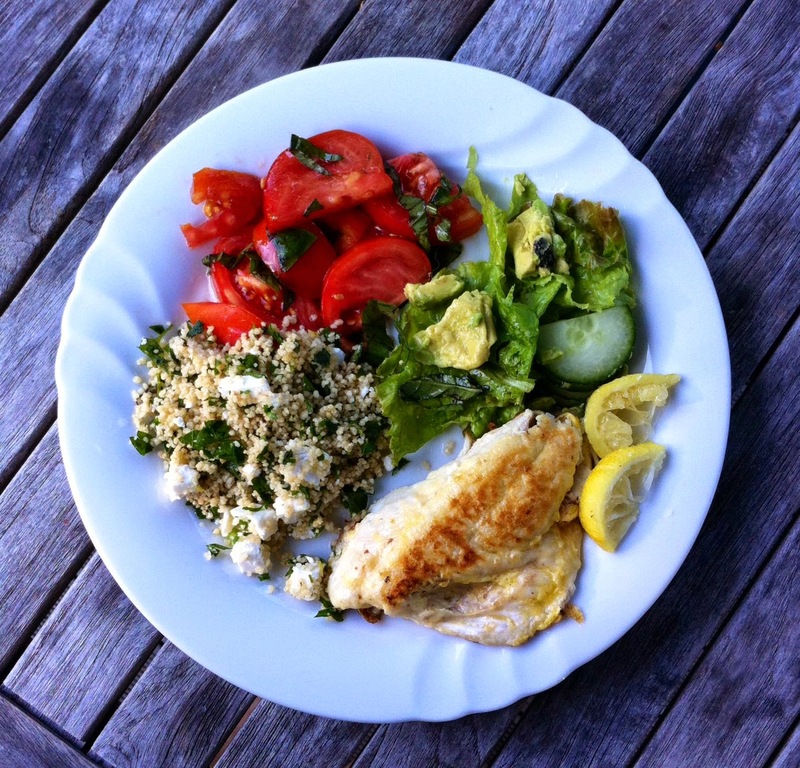 So for dinner tonight it was freshly caught snapper, wholemeal couscous tossed with lots of parsley and feta , tomato salad with basil, and butter lettuce tossed with cucumber and avocado. So good! To cook the snapper I heated the frying pan until really hot, then sprayed it with avocado oil spray ( as avocado has a high burning point). Floured the snapper fillets with seasoned flour, then tossed them through a beaten egg and fried them on one side. Before turning I sprayed the fillets with more avocado oil. The result was fish which was tender inside but and alittle crusty on th eouter. We have so much flat leaf parsley growing in the garden right now that I chopped a large bunch of it, added it to aome wholemeal couscous, and small cubes of feta and dressed it with lemon juice and olive oil. The tomato salad was simply freshly harvested and sliced tomatoes with a drizzle of balsamic vinegar. And the lettuce salad had cucumber and avocado added. 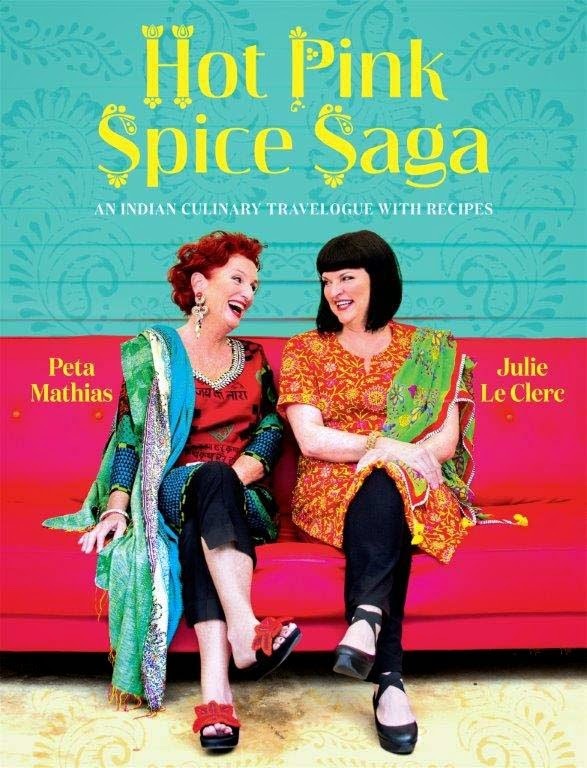 Two of New Zealand’s best loved cooks had an amazing time in India recently and recorded their journey in Hot Pink Spice Saga: An Indian Culinary Travelogue with Recipes. It’s a great read. Peta Mathias, in her irrepressible way, wrote the words while Julie Le Clerc took the beautiful colour photographs. They stopped off in four very different locations: Rajasthan, Goa, Kolkata and Darjeeling where they explored markets, palaces, temples and a tea plantation .On the way they sampled much delicious food, some created by India’s finest chefs but also tasty street food cooked with the most basic equipment. Wherever they went they experienced outstanding hospitality from many generous cooks who welcomed them into their kitchens and shared their recipes. In Delhi, Peta who is known for her colourful wardrobe and jewellery was finally out-blinged at an Indian wedding by the rich ladies from a high caste Indian family. They were attired in gold lame saris, silver embroidered hot-pink dresses, and real jewels dripping everywhere. In this mega city she was also exposed to the huge gap between the exceedingly rich and the very poor. She visited a group of displaced women living in abject poverty in a roadside encampment to see their craft project. In Jaipur: she and Julie saw the exquisite art of block printing fabrics at first hand and indulged in some serious clothes shopping. In Kerala they hired a jackwood boat with a coconut fibre roof for a languorous meander along the tranquil and dreamy Kerala backwaters, ate fish straight out of the ocean cooked in shacks at the wharf, and were blown away by a performance of Kathakali theatre. But one of Kerala’s main attractions, an all over ayurvedic massage, did not appeal to Peta. On one occasion she was so well oiled that she slid off the massage table. In Kolkata they stayed in the ‘absurdly’ grandiose Oberoi with chandeliers the size of shipping containers and black marble floors. A stay at a Tea Estate in Darjeeling in a luxurious lodge was heaven on earth. From there, if the weather was right, at about 5 am in the morning, one could see the white peak of Kanchenjunga, the third highest mountain in the world. They did have one horrifying ten hour train journey from Siliguri to Kolkata about which Peta does not mince her words. But overall they had many amazing times and, remain very passionate about the joys of travelling in India. Included are 60 of the recipes which they gathered on the way, adapted so they can easily be prepared in New Zealand kitchens. Julie’s photographs make them look absolutely mouth-watering. Madhur Jaffrey has long been one of my favourite cookbook authors. She was the one who taught our generation that we could easily cook authentic Indian recipes at home. After winning a scholarship to a prestigious drama school in London she found she couldn’t stomach the stodgy English food dished out in the Varsity canteen. Homesick for fragrant curries she asked her Mother to send her some of the family recipes. These duly arrived handwritten in a series of aerogrammes. It started her passion for Indian cooking which has never abated. At 83 years old, she is still a prolific cookbook author and a world authority on Indian cooking. So far she has written fifteen cook books starting with An Invitation to Indian Cookery, published in 1973. On her frequent travels to India she continues to gather new recipes that families eat at home, in local cafes and temples, at parties they throw for each other, and at weddings and religious festivals. Curry Easy Vegetarian is her latest book and it’s a real gem with more than 200 new and healthy recipes. Every recipe I have cooked so far: such as her simple scrambled eggs, her vegetarian version of butter chicken, Punjabi-style beetroot with ginger and a spicy peanut crumble have been easy to make and tasty. 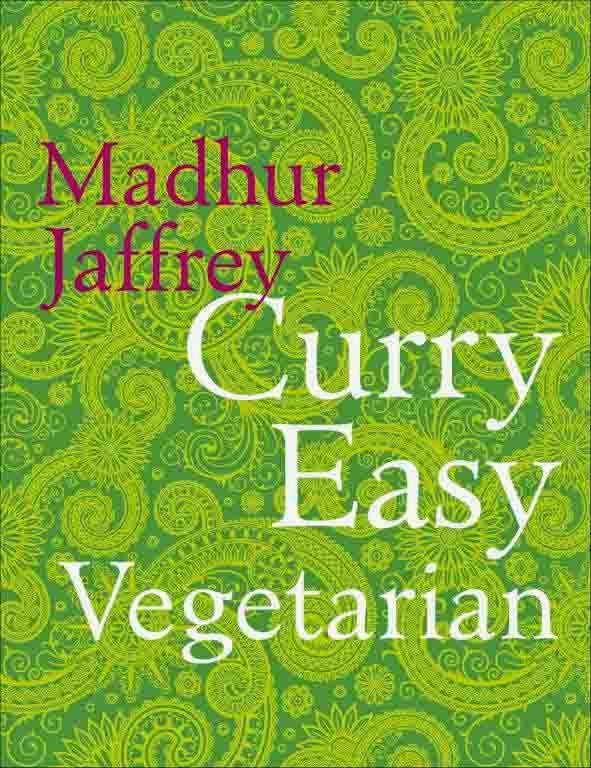 This book would make a great present for any vegetarians in the family who enjoy Indian food.